Yes, this just happened. Now there is a new source of knowledge and a convenient go-to reference for all system administrators who are eager to keep a tight grip on network security. There is hardly a technical community that would lack a discussion of malware threats, hacker attacks, or some recently discovered vulnerability that’s been torturing villagers for quite a while. And we can’t step aside in this battle. 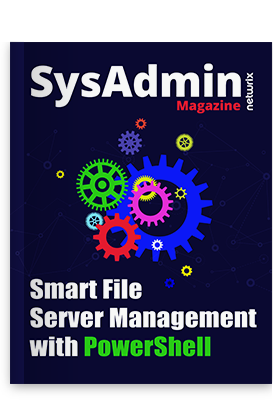 Today we present to you the very first issue of “SysAdmin Magazine” created by Netwrix Team and packed with useful information and tips on how to stay atop the waves of the ever changing ocean that is IT security. New monsters appear every day, and the integrity of the critical systems such as Active Directory, Exchange and others is constantly at risk. The trick is to keep breathing: and this is where “SysAdmin Magazine” might come in handy. This issue is focused on securing Active Directory and learning to avoid the worst nightmares of a system administrator responsible for sensitive data stored in this application. Don’t hesitate and feel the taste of a crispy end-of-year issue of “SysAdmin Magazine”. Stay secure in 2015 and keep an eye on the changes!